As far as a pretty turn key reference library, this is a pretty good deal. You know how I feel about book value and I'm not going to rush out and purchase this but I have to admit, having those (3) CD's within arm's reach is pretty tempting. 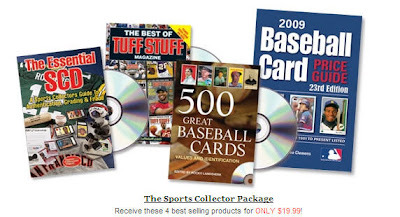 Damn that is a pretty good deal, Although the Standard Catalog of Baseball Cards is my BB bible. I'm no fan of book value but there is a reason it's call a price GUIDE. And as a reference I think it's just incredible plus the 2010 edition comes with a cd with stuff all the way to early 2009 releases on it. If your looking for info on oddballs and early issues it's pretty awesome. I just wish they'd update the other sports catalogs as the newest edition of the football catalog is from 2005.